On the 18th (Sun), you'll have a packed day of sightseeing: enjoy the sand and surf at Landa Beach, see some colorful creatures with a scuba or snorkeling tour, and then take some stellar pictures from Sea Caves. For maps, where to stay, ratings, and other tourist information, read Ayia Napa online day trip planner . Geneva, Switzerland to Ayia Napa is an approximately 8-hour combination of flight and bus. You can also do a combination of flight, car, and bus; or do a combination of bus, ferry, and car. You'll lose 1 hour traveling from Geneva to Ayia Napa due to the time zone difference. When traveling from Geneva in November, plan for much hotter days and somewhat warmer nights in Ayia Napa: temperatures range from 27°C by day to 15°C at night. Cap off your sightseeing on the 19th (Mon) early enough to go by car to Peyia. Get outdoors at Scuba & Snorkeling and Lara Bay Turtle Conservation Station. Satisfy your inner culture vulture at The House of Dionysus and Panagia Chrysopolitissa Church. When in Peyia, make a side trip to see Paphos Harbour and Port in Paphos, approximately 32 minutes away. For traveler tips, maps, reviews, and tourist information, read our Peyia tour itinerary maker . Traveling by car from Ayia Napa to Peyia takes 2.5 hours. Alternatively, you can do a combination of bus and car; or take a bus. In November in Peyia, expect temperatures between 27°C during the day and 16°C at night. Finish up your sightseeing early on the 22nd (Thu) so you can go by car to Limassol. Kick off your visit on the 23rd (Fri): tour the pleasant surroundings at Pissouri Beach, then tour the pleasant surroundings at Kourion Beach, and then explore the ancient world of Kolossi Castle. Here are some ideas for day two: kick back and relax at Lady's Mile Beach, explore the historical opulence of Limassol Castle, and then explore the ancient world of Amathus. To find photos, other places to visit, reviews, and other tourist information, go to the Limassol tour planner. Getting from Peyia to Limassol by car takes about 1.5 hours. Other options: do a combination of car and bus. 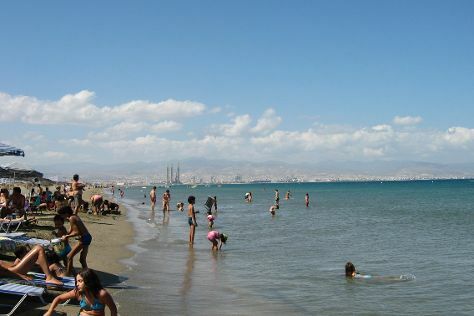 In November in Limassol, expect temperatures between 26°C during the day and 16°C at night. Finish your sightseeing early on the 24th (Sat) so you can travel back home.